Jealousy is ugly. Right? That’s what most of us believe. It’s an ugly, archaic emotion that we’re embarrassed by. We shove it down because it's so disturbing or we react from it unconsciously. Jealousy pulls to surface insecurity. It shows us where we think we’re lacking and what we don’t believe we deserve. But what if, like pain, we learned to embrace feeling jealous instead of rejecting it? When we feel jealous a feeling surfaces that points to an old story of unworthiness. If she is beautiful it means I’m not. If she is successful it means there’s not enough room for me. He is bringing to life that same idea I once had so now I can’t do it. No one will love me the way they love each other. I could go on. Jealousy is not what keeps us caught in this trap of perpetuating false beliefs, our interpretation of the message does. Jealousy is actually pointing to the fact that you have that very seed within you. What you are witnessing in another person is craving to be expressed within you. You know that feeling you get when you read a poem or see a piece of art that speaks to your soul? Many times I say to myself with a smile, “Damn, I wish I’d done that.” There is a lightness pointing to the fact that I’m capable of creating this caliber of work, and I know it. There is an appreciation of the work and the artist instead of a rejection. There is inspiration. Jealousy shows up when we're not living in alignment with our highest selves. We see something we want to do, experience, or have ourselves, and because we aren't living to our true potential we feel like it's outside our reach. We choose stay small, holding onto the beliefs that keep us stuck. I used to get frustrated by my jealousy. I would judge the fact that I was feeling jealous. If I really love and accept myself than why am I jealous? So instead of using my feelings as information and allowing myself to move back into alignment I would shame myself. I'd hide my feelings and hide myself even more. I have learned to surrender to my feelings, to allow them to guide me. When I feel the heaviness of jealousy in my body I stop in my tracks. I use the information. Jealousy teaches me that I'm out of balance. It shows me that I am not connected to my own soul. Feeling jealous shows me, loud and clear, that I am stifling my own soul. Jealousy is a gift. It’s here to show you when you’re not showing up. When we get stuck in feelings of jealousy and let the stories pile up we’re wasting incredible precious energy. It's the energy we need to use to shine our own lights. So learn to pay attention to the feelings in your body. The faster you can recognize what a feeling is really pointing to the faster you can get back in alignment with your true self. The truth is that Beauty Begins Within. If you feel inferior to another person externally or in any other way it’s because you are disconnected from your true self. Join in on the movement to redefine beauty and learn how to love yourself so you can really begin to live while you’re here. Stop wasting your time and energy being less than the incredible beauty you actually are. 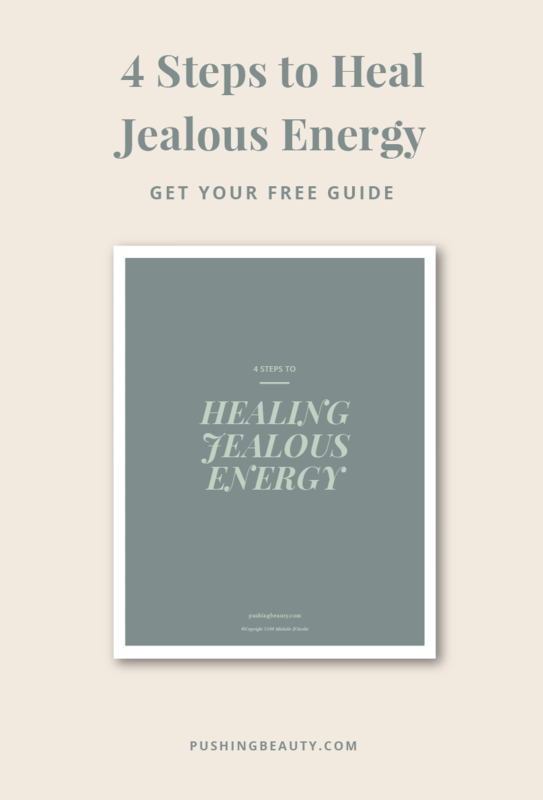 If you struggle with feeling jealous download my free 4-step guide to healing jealous energy below.